I’m here with Mack from Fantasy Flight Games, lead designer of the new tabletop mini game Dust Warfare! This interview will aim to shed some light on what Dust Warfare is all about, how it plays, how the design process was implemented and how you can start playing! It's not too in-depth, just sort of a teaser for what Dust Warefare is since we haven't really done much on the system at all! If you're looking for more info you can ask in the comments or check out the links provided. You may have seen Mack in the chatbawks and he also plugs his blog which you should check out. So let’s get down to it. Me: First things first – what is Dust Warfare? What’s the background and why would gamers be interested in it? 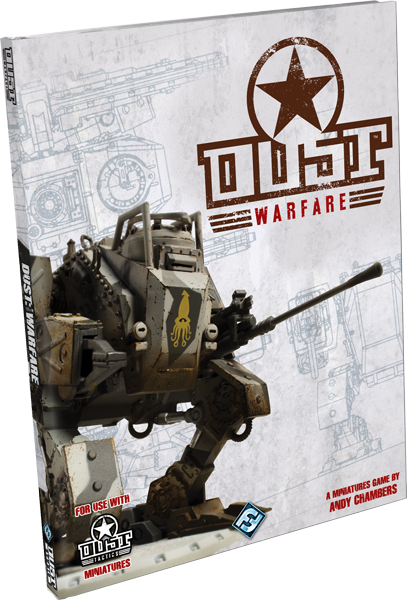 Mack: Dust Warfare is a squad based miniatures game set in Paolo Parente's Dust universe. It's a sci-fi take on WWII. So think Harry Turtledove with a lot more pen-up girls. The aesthetic is this fantastic combination of gritty war and pop culture. So walking tanks and power armor, meets zombies and machine guns. Me: I know one of the big things you were concerned about during designing was play testing and ensuring you got as much feedback about every aspect of the game as possible. How did you go about this and why? Mack: It's a tricky thing. I'm actually talking a lot about play testing on my personal blog, dicelikethunder.com. Basically, it's a mixed bag. For miniatures games there are a lot of tricky things to overcome to get the same level of testing that a computer based strategy game can get. The approach I took was to just play a lot, and watch people play a lot. Lots of notes. I sent it out to playtesters as well, but because I couldn't view the entire game, I had to rely on them for fun-factor and rules clarity questions. If a remote playtester had balance issues, I looked into them, but I had to make that call by actually watching games be played. So if a remote tester told me “Angela is to strong” (which happened), I had to observe Angela in a minimum of 10 games myself, taking extensive notes. It turned out, that Angela could be countered with proper strategy (not just by taking the right units) so we ended up not making much of a change (she did end up going up a few points in cost). Me: And was it successful? Mack: I think so. The Battle Builder really helped balance the game once players got used to things. A three or four month testing cycle really isn't long, when you consider how much time it takes a metagame to shake out in a miniatures game, players were still finding new strategies near the end. I learned a lot from it. Nothings ever “razors edge” perfect, but I feel pretty happy with the variety of armies and tactics we have. The Battle Builder really helps by letting players capitalise on a concept called “lead position disadvantage”. Me: Do you believe this makes your game almost uniquely more competitively designed and was that one of the major design keys during the design process? Mack: Uniquely? I don't think so, there are a lot of really good tournament games out there. We definitely made sure it was as easy to run a Dust Warfare event as possible. There was a large focus by the team to make it more approachable both for players and organisers. I believe that it really shows in the system. Me: So Dust Warfare has been out for a while now and you’ve hopefully gained some traction in the market. For those interested where could they check out some games to start learning? Mack: Fantasyflightgames.com is a great place to start, as is the official Dust Warfare Facebook group. Lots of really helpful fans there. FFG has several videos on the website, that really help new players get a handle on what to expect. Me: What are the rough costs involved in starting up as well? How does this equate to a full, recommended points-size army? Mack: In the core rulebook we tell the players that 200-400 points is “tournament size”, 300 being a good middle ground. Expect a 300 point army to run from $150 to $250 American. That's assuming you don't split a Dust Tactics box set with a friend, and don't get any of the big tanks. They actually SAVE you money, at around 90 points, they only cost $40... so that's a third of your army! If you want to spend a bit more, you can even get them pre-painted. Me: And for the more serious of gamers are there any Fantasy Flight sponsored groups or tournaments in the future? Mack: I'm not certain, keep an eye on the FFG website! Me: Anything else you’d like to talk about or add? Mack: I think you've covered most of it. It's a miniatures game designed for competitive and narrative play. 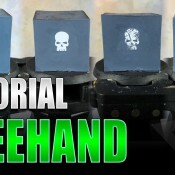 The miniatures also come assembled and primed, so you can take them out of the box and start playing right away!